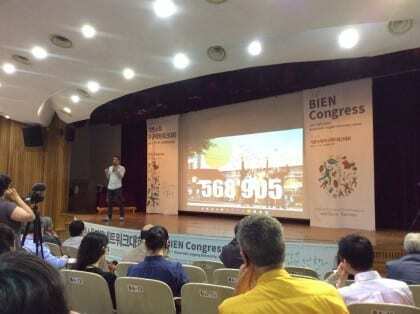 The 16th Basic Income Earth Network Congress has just started on 7th July in Seoul, Korea. People from around the earth are attending. Karl Widerquist, a co-chair of BIEN, is posting live reports on Reddit. He is encouraging everyone at the conference to contribute their perspectives to the thread as well. The conference will run for 3 days, until 9th July. My hope is that one day, all governments will create what I call a “Birthright Bond” which is purchased for every citizen when they are born and which expires when they die. In this bond, the government agrees to pay to the bondholder a fixed sum (adjusted for inflation) from birth to age 10; incremented from age 11 to age 18; incremented from age 19 to age 65 and adjusted from age 65 until death. Such a bond is provided for every citizen regardless of their economic value to society. Such a bond is not a safety net but rather a starting point for all people.